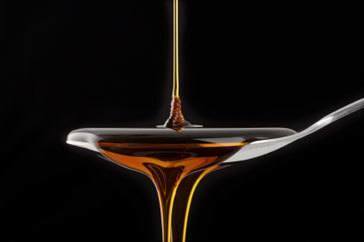 The Spanish for syrup, jarabe, comes from the same root as the English: the Persian/Arabic sharab, which means “a drink, or wine”. The drastically different (at least superficially) words are explained by the sh- and related (such as, sy- ) sounds changing to the Arabic-sounding j- sound in Spanish — but not English. Thus, the j-r-b of jarabe maps to the sy-r-p of syrup.